The Medici, originally a gallery and coffee house, remains one of the best coffee houses in the city. It is now located on 57th St. between Kimbark and Kenwood Ave. near the University of Chicago campus. 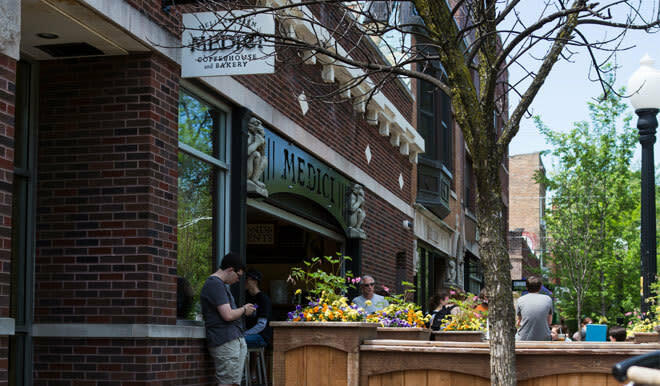 Open for lunch and dinner, The Medici serves an eclectic menu, is known for its Chicago style pizza, some of the “best hamburgers in Chicago,” baked-goods and desserts. The setting is casual and the architecture, artwork and sculptures provide a unique and intellectually stimulating atmosphere.